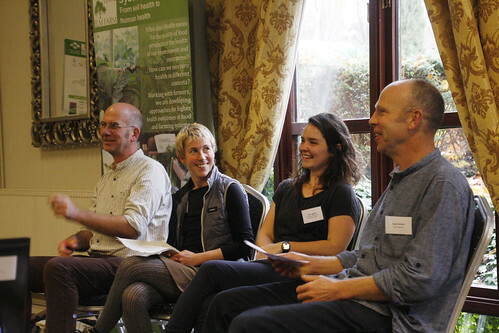 The over-riding theme of these three sessions was improvement to organic horticultural systems, whether through diversification into herb production, taking control of organic seed production or using the rotation to improve soil health. Ellen Rignell presented the activities undertaken at Trill Farm Garden, highlighting the main challenges (workload and required technical expertise) for their small business of saving and producing seed for commercial purposes. She recommended that growing a diversity of produce while specialising in high value crops is crucial for small businesses like theirs, and concluded her presentation by stressing their political commitment to seed saving. The characteristics and some key figures of Real Seeds and Vital Seeds were illustrated, as well as the mission of the Gaia Foundation, aimed at encouraging home seed saving by offering open pollinated seed and technical advice to growers. The talk by David Price followed which emphasised how a small community-owned seed company like the Seed Co-operative can take shape as a viable business, since seed sales have been providing a sustainable income stream. Key elements to the success of the Seed-Cooperative have been: increase in profit on seed sales, and the identification of production costs; sharing technical skills, as well as the values of seed sovereignty within the growers network and beyond (with volunteers and visitors). Niels Corfield & Adam Keeves jointly facilitated this session. See presentation here. Adam presented on his experiences as a grower and from his study tour of field horticulture operations in the Netherlands and Belgium. The latter particularly focused on minimum tillage tools and innovations. 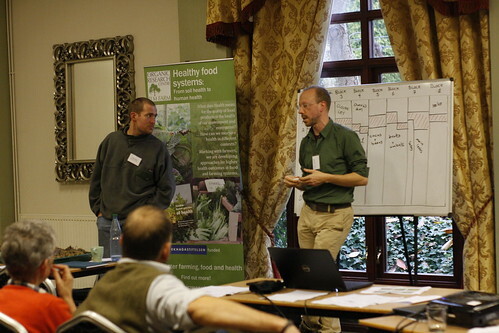 Niels delivered the soil health principles as a thinking and decision-making tool and the theory behind them, as well as evidence of their application, gleaned from visual inspections of soil under different management regimes. 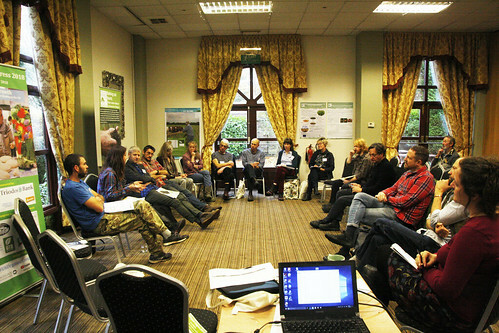 Once the presentation was over attendees were invited to participate in an exercise where they ranked six different green manuring options using a matrix based around the soil health principles. This same practice then was carried over to a critique of a standard horticulture rotation, identifying points of intervention. Again, using the soil health principles as a lens to through which to improve or eliminate management practices.